We are deep into Fall. The air is getting crisp and the colors are breathtaking. I love this time of year. With the cool air comes the need to get in my kitchen to bake. I've been looking for muffin recipes to stock up in the freezer. My son loves them for snack at school. Anyway, I found this little treasure. 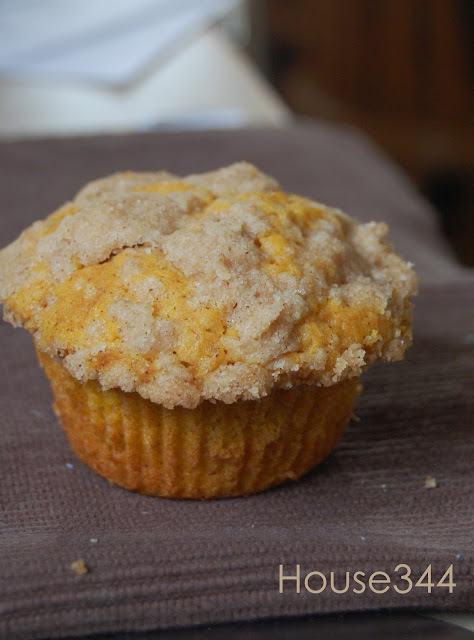 If you're looking for a Fallish pumpkiny muffin, here you go my friend. :) Pumpkin + Buttery Streusal, you can't go wrong. In a large bowl, combine the flour, sugar, baking powder, pie spice and salt. In another bowl, combine the eggs, pumpkin, oil and vanilla. Stir into dry ingredients just until moistened. Coat muffin cups with cooking spray or use paper liners; fill three-fourths full with batter. For topping, combine the flour, sugar, brown sugar and pie spice; cut in shortening until crumbly. Sprinkle over batter. Bake at 350° for 25-30 minutes or until a toothpick inserted near the center comes out clean.